One of my customers, Irma, does beautiful metal embossing using traditional methods. This involves working a sheet of metal using specialty tools. She makes wonderful, one-of-kind treasures that take time and patience. 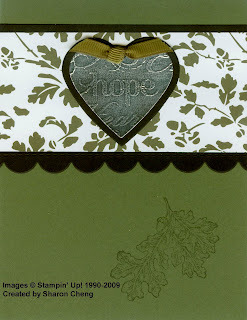 I wanted to make something that had the flavor of metal embossing using Stampin' Up! tools. 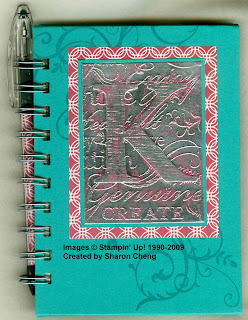 This notebook is what I designed for my downline who went to Stampin' Up! 's convention in Salt Lake City. 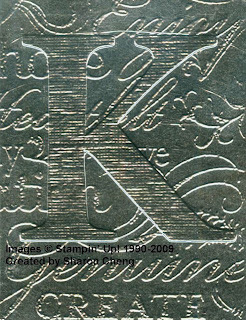 It uses a faux metal embossing technique that is easier and faster than traditional metal embossing. Step 1. Stamp your image with Versamark and heat emboss with embossing powder. Since these pieces will be covered, it's a great way to use up your scrap cardstock. I have no idea why I ever bought lavender embossing powder! I used the background stamp, Tres Chic for this project. Step 2. 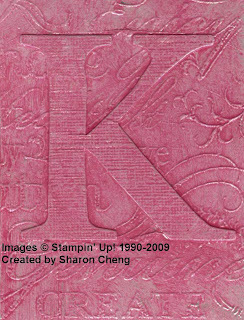 Use your Big Shot, textured cardstock and the Serif Essentials Alphabet die to make the monogram. 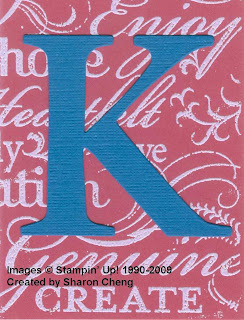 Adhere your monogram to the embossed cardstock. Step 3. 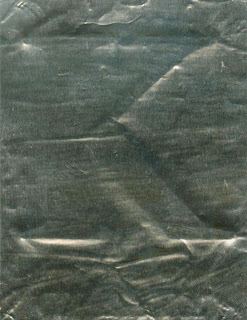 Cover the entire piece with aluminum tape that you can purchase at a hardware store. I found 3 in. wide aluminum tape at Harbor Freight if you have that store in your area. The project doesn't look so great at this point. Step 4. Run the piece through the Big Shot similar to how you would use a texture plate. Going from bottom to top, make your stack using the following items: Multipurpose Platform on Tab 2, one Standard cutting pad, the piece of cardstock with tape side up, Silicone Rubber pad and then the Texturz Impressions Pad. You could stop here if you didn't want to add paint for more dimension. Step 5. Cover the entire piece with acrylic paint. This is another one of those steps that doesn't look too good at first. I used white acrylic paint that I dyed with Classic Rose Red ink. Add a few drops at a time. You don't need a lot of paint or ink. Once the paint is dry, you can rub off most of it with a paper towel. That's how I ended up with the piece that I used for the notebook pictured at the top of this tutorial. This is the card that I made for my convention swap using this technique. I simplified it by skipping Steps 2 and 5. Because I made about 50 cards, for Step 1 I baked the cardstock in my craft oven instead of using the heat tool. Things went much faster that way. Being able to use stamps to get a variety of images is what I like most about this technique. Stamps with thin or really bold images don't seem to work as well with this technique. Questions? Please leave a comment and I'll post the answer for everyone since more than one person may have the same question. This is awesome Sharon!! Love it! I was wondering if the texture plates that SU! sales will also work? The texture plates and embossing folders that SU makes will also work. I recommend putting the aluminum tape on the cardstock and then running it through the Big Shot.